Tom Hanks transforms into Mister Rogers for new movie — see the photo! 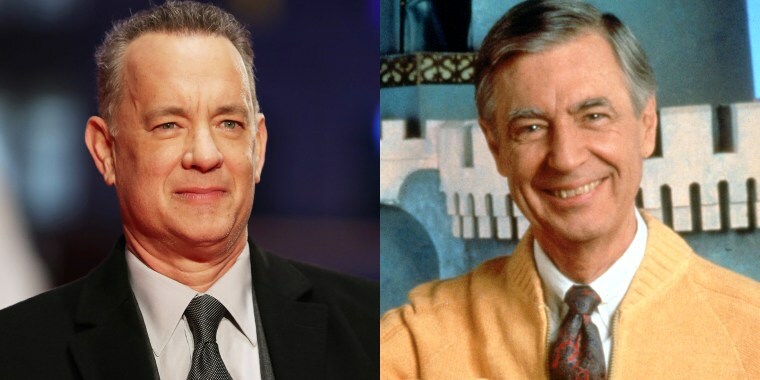 Tom Hanks perfectly transforms into Mister Rogers for new movie — see the photo! Hanks sure looks like he's up to the challenge of portraying the late children's TV host. A photo of the two-time Oscar winner dressed as Mister Rogers on the set of his upcoming movie about the late children’s TV show host popped up Thursday on Twitter. “Tom Hanks is Mister Rogers, coming to a neighborhood near you October 2019,” the tweet from Sony Pictures reads. Clearly, Hanks is ready to tackle the role. He's got the perfectly parted hair, the sneakers and, of course, the signature cardigan sweater that so many kids grew up watching Rogers wear. Mister Rogers — real name Fred Rogers — hosted his beloved show, "Mister Rogers' Neighborhood," from 1968-2001. He died in 2003. The currently untitled movie, which will also star Susan Kelechi Watson from "This Is Us," is scheduled to hit theaters Oct. 18, 2019. The film is "a timely story of kindness triumphing over cynicism, based on the true story of a real-life friendship between Fred Rogers and journalist Tom Junod," according to a press release from Sony Pictures. "After a jaded magazine writer (Emmy winner Matthew Rhys) is assigned a profile of Fred Rogers, he overcomes his skepticism, learning about empathy, kindness, and decency from America's most beloved neighbor." This is hardly the first time Hanks has portrayed a popular real-life figure. He portrayed Walt Disney in "Saving Mr. Banks" and famed pilot Chesley "Sully" Sullenberger in "Sully."